Now head back towards Rellekka until you reach the Council Workman. Use the Beer on him and he'll give you a Strange Object. Warning: the Strange Object will explode, so don't light it unless you're near the pub! You can find Olaf the Bard to the east of the pub, and he'll ask you to perform for a crowd for his vote. After talking to him about how to perform and how to make a Lyre, leave town and follow the east path until you see a Rare Tree symbol on your map. Cut a branch from the Swaying Tree, and then use your knife with it to cut it into an Unstrung Lyre. 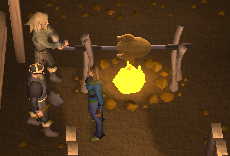 Tip: If you don't meet the Crafting and Fletching requirements, there are two NPCs in Rellekka who drop an Enchanted Lyre. Lanzig is level 48 and he located in the southeast corner of Rellekka. The lyre is a very rare drop from him. You can also kill Borrokar, who is also level 48. He is located in the northeast corner of Rellekka, in the house just west of the mine. The lyre is a rare drop from this NPC. If you obtain the lyre using this method, you do not need to follow the below instructions on enchanting it. However, this method takes longer than making the Enchanted Lyre yourself. Now head southeast and talk to Lalli (who is a troll) about another man that came by, head back to the pub and talk to Askeladden outside. He gives you a Pet Rock, and then pick an onion, potato and cabbage from the garden to the southeast. Go back to Lalli, and then put the rock and veggies into the stew, talk to him and then he'll give you some Golden Fleece. Use this with a Spinning Wheel to get Golden Wool, and then use it on the Lyre. 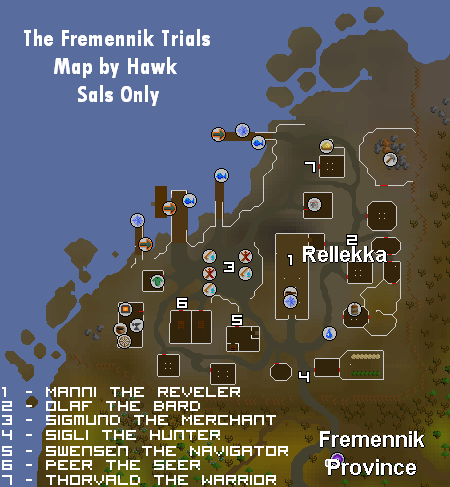 The nearest usable one can be found in the Seer's Village, as you are unable to use the Spinning Wheel in the Fremennik Village yet. Sigli the Huntsman is just south of the pub, and he wants you to kill the level Draugen. He'll give you a Hunter's Talisman when you accept. Leave the village and click 'Locate' on your talisman, wandering around in the direction it points to until it appears. The Draugen is level 96 and is weak to fire spells. It is possible to safespot him over nearby objects if any exist in the location you find him. After killing it, go back to Sigli. Peer the Seer is just southwest of the market, and he wants you to solve the puzzle in his house for his vote. Before you go in, you must have no items on you. If necessary, Peer the Seer can bank all of your items. To start, first try to open the door and read the riddle. Since each person gets a different riddle, you need to figure it out on your own, but they are relatively simple. Each line give you 2 different words, each with a letter in them, which you will need to spell out a word, depending on what the riddle says. Now go through the door and up the ladder. Now study the Unicorn's Head for a Red Disk, and the Bull's Head for a wooden 1. Search the bookcase to find a Red Herring, which you can cook on the range to get Sticky Red Goop. Use the goop on the Wooden Disk to get a Red Disk, go down the east ladder and use the disks on the Abstract Mural to get a Vase Lid. Fill the Vase with water from the upstairs tap, put the lid on it, and use it with the Frozen Table in the northeast corner to get a Frozen Key. Note: The fourth form is not necessary to kill for this quest, but for those who wish to kill Koschei the Deathless, it is possible. 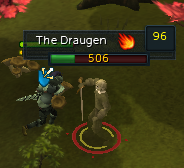 The fourth form used to be very difficult, however with the Evolution of Combat update has been made much easier. The below can serve as a reference to very low leveled players trying to defeat Koschei. For gear, it is suggested to bring 5 Rings of Recoil, 1 Super Attack, Super Strength and 1 Super Defence potion, as well as around 12 sharks. 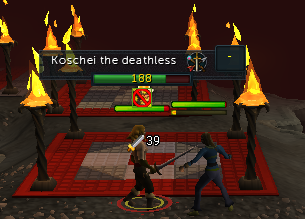 Basically, after killing the third form, Koschei the Deathless will strengthen and be a much tougher opponent. By using a Ring of Recoil, each damage he deals to you, mainly 10s, will hit him as well. After about 4-5 Ring of Recoils destroyed (don't forget to eat! 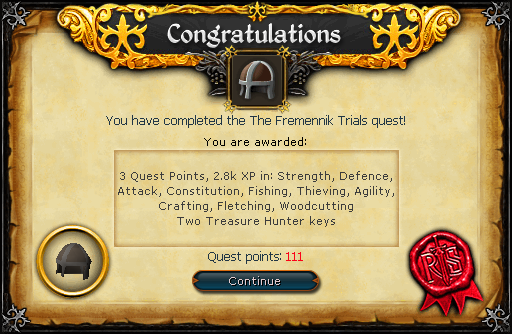 ), Koschei the Deathless will die and drop a Fremennik Blade.